Snark Sailboats: Super Light, Super Fun! More people have learned to sail on Snark boats than any other boat. Easy to sail, very portable, durable, and affordable! Sail Swap! Only at SailboatsToGo: Visit our Sail Swap page to select your sail. Or, for additional cost, you can upgrade to a white dacron sail or one of our premium Neil Pryde sails. Sail swap and white dacron upgrade offers apply only to new purchases of Super Snark or Sunflower from SailboatsToGo. Availability: No Sunflowers are available. Very few Super Snarks and they are factory seconds with prominent cosmetic defects. No Sea Skimmers and No Sunchasers . All models expected some day, but whether that is months or years away, we cannot say. We have many other portable sailboats available for your consideration. For more information on sailboats available for immediate shipment, or to order a Super Snark factory second, click here. We will contact you about shipping cost. 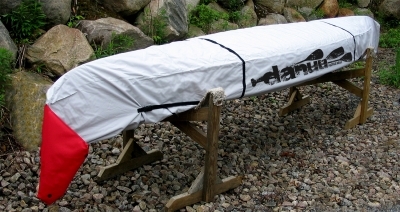 All our Snark boats feature ABS ArmorcladTM polymer cladding on a lightweight styrofoam core. Unsinkable. Accomodates two people (310 lbs) and comes with all the riggings. Just throw it on your cartop and head for the water. Hull is 11 feet long, 3' 2" wide; whole boat weighs just 50 lbs. Sail area is 45 square feet. Hull only is 43 lbs. Super Snark with our rainbow stripes sail. Similar to Super Snark, but sail area is 55 square feet for greater speed. Also, Sunflower has a covered foredeck, while Super Snark is completely open. Length 11 feet. Beam 3' 6". Weight 65 lbs. Note weight of 50 lbs is hull only. More sail area (70 sq ft), with a separate jib and mainsail. More carrying capacity - 3 people, 475 lbs. Still very light weight and car-toppable at 55 lbs. Note: Sometimes there are long wait times for this boat so give us a call if you want info on current availability. Shipping varies (usually $500 - $900). You can place your order and we'll adjust the shipping after checking with you or you can call or email with your zip code and ask for a shipping quote. The Sunchaser I has a 72-square-foot lateen sail. The lateen sail's advantage is that it is very easy to use, very easy to rig, and very easy to raise and lower. With just one sail to handle, it's very easy to sail. Comfortable seating space for 4 adults. Shipping varies. Generally $500-$900. You can place your order and we'll adjust the shipping after checking with you or you can call or email with your zip code and ask for a shipping quote. For those who want more speed, the fun of handling 2 sails, and don't mind the extra steps involved in setting up a sloop rig. *Snark Boat Terms: Not returnable. Defects covered by manufacturer's warranty. Delivery dates are estimates only. Do not sign for your boat until you have determined there is no shipping damage. Refuse delivery if damaged so we can send another. Bonus offer - (a) 2 adult lifejackets and a paddle or (b) a bag for cartopping your sail, mast and spars free with your sailboat. Neil Pryde Sail Upgrade. Substitute the standard sail for one from sailmaker Neil Pryde. Four color schemes to choose from. White Dacron Sail upgrade. Substitute our white dacron sail for the standard sail that comes with your Snark. Stabilizer Pontoons. To reduce the risk of capsizing. Roof Racks. With telescoping extension to make it even easier to get your Snark on and off your car roof. Rowing Rig. Converts your sunflower or Super Snark to a rowing shell! Portage Cart. Lightweight folding hand trailer. Comes apart and folds compactly in less than a minute! Bag for car topping and storing the sail and all the poles (mast, boom and top spar) for Super Snark, Sunflower, Sea Skimmer. Slip this on top of your Super Snark mast and get 6 inches more headroom under the boom! Also see Adjustable Mast Extension for same or greater mast height increase. Mast Ext. or Adjustable Mast Ext. Cover for Sunflower, Super Snark or Sea Skimmer to protect hull from destructive UV rays and keep it clean. Includes built-in red flag for going down the road and the flag is also a bag for self-storage of the cover. The same great Sunflower Sailboat, except this one is made to European standards. The price is 1700 Euros, which at the time of this writing is $1997 (US dollars). After you order, if there has been movement in the exchange rate, we will email you about a proposed adjustment up or down in price. You can approve, or cancel and get a refund. Shipping will be calculated for your home address after you place the order. The amount of shipping charged below is place holder. When we know the actual shipping charge, we will propose to adjust your charge up or down as needed and you can approve or cancel. Our price and shipping charges will include customs processing fees, but not the actual taxes of your country, which you will pay direct to your government. These may include duty and VAT.